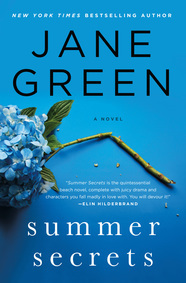 Today’s Maximum Shelf Awareness features one of our favorite women’s fiction authors, Jane Green, and her latest novel, SUMMER SECRETS. Green has never shied away from tackling hot-button issues, such as extramarital affairs and divorce, mental and physical illness, families in transition, death and grief and the angst of midlife. SUMMER SECRETS examines the heart, mind, and soul of a woman grappling with alcoholism and how that addiction pacifies and plagues every aspect of her life. See the full summary, review and interview with Jane Green on Shelf-Awareness.com. SUMMER SECRETS will be available from St. Martin’s Press and Macmillan Audio on June 23, 2015.